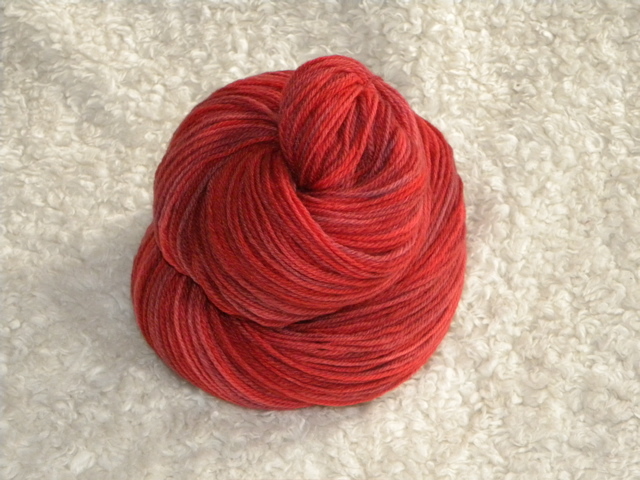 So remember in my last post how I said I had something exciting and yarny to share with you? I’ve been asked to be a vendor in not one, but TWO fairs! First I’ll be selling my fiber at the Tattersall Farm Day event here in Haverhill. That’s Sunday, September 16th. Then I’ll be a vendor at the Lynn Fall Festival on the Waterfront the weekend after that! WooHoo! I get squeaky excited every time I think of it! And guess what! It gets even better. My sister (fellow dyer, keeper of A Polish Granddaughter blog, and owner of Escape to Evermore) will be sharing the booths with me! My friend Vicki will be hanging out with us too, with her spinning wheel, luring in the fiber enthusiasts. And my mom might even be here from FL to help out! September is going to be one super fun month. 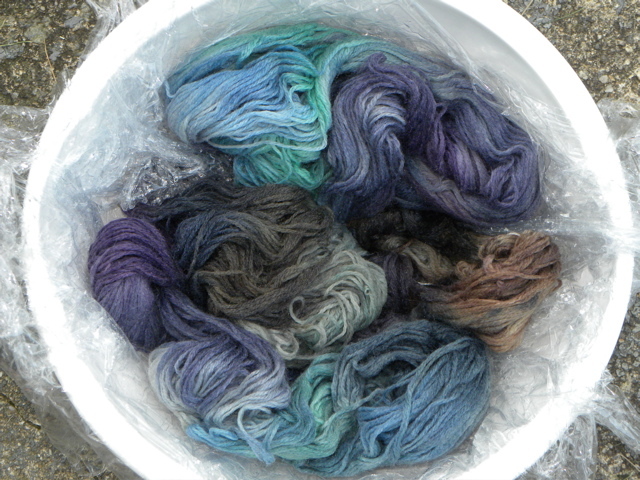 As you can imagine, I’m going to be spending all my time dyeing up yarn and fiber. I’ve started with a few different colorways already. Wanna see? 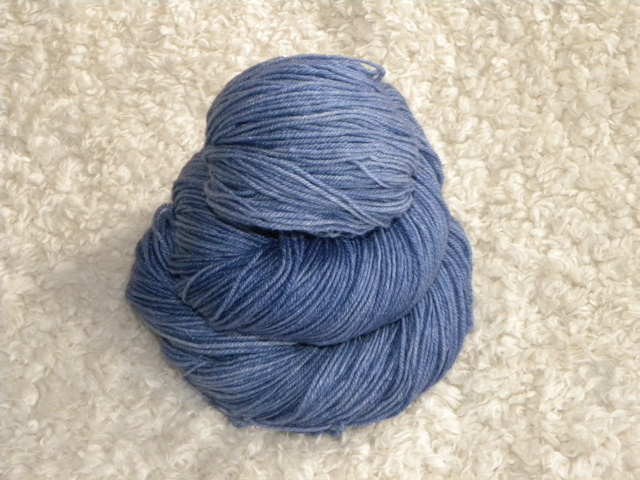 It’s next to impossible to tell, but Morning Crocus and Favorite Blue Jeans are made with sparkly yarn. It’s a very subtle sparkle, and I can’t seem to pick it up with my camera. All of the above will be in my Etsy shop for now. And today I hand painted two colorways that just might end up being my favorite ever. Especially this first one…. 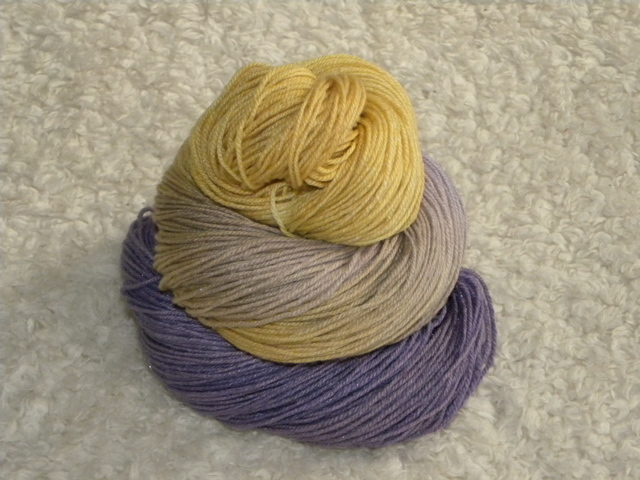 Now, both of the pictures are of the wet yarn, and things tend to lighten more than I expect when they dry, but I’m hoping it stays very close to what you see above. I call it She Hates to Wear Dresses. And below we have the second one….unnamed as of yet. But I love it too. Hand painting the yarn as opposed to immersion dyeing is definitely more time-consuming, but I feel like I have so much more room for creativity. Holy Moly Guacamole and She Hates to Wear Dresses are made from a yarn with a more defined twist than the others, and I think that’s my favorite base yarn. 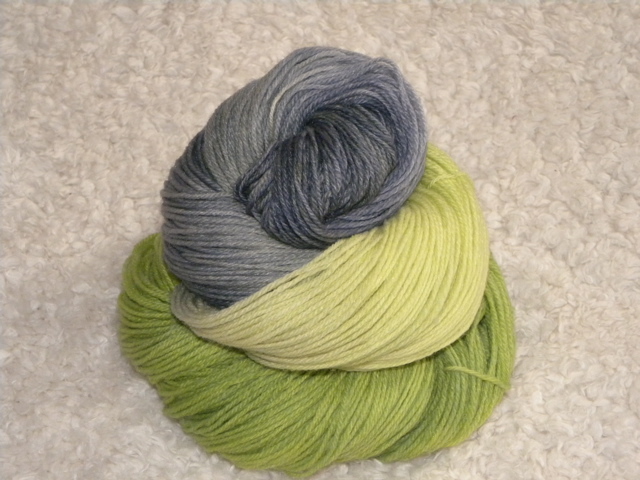 It’s a Superwash Merino. 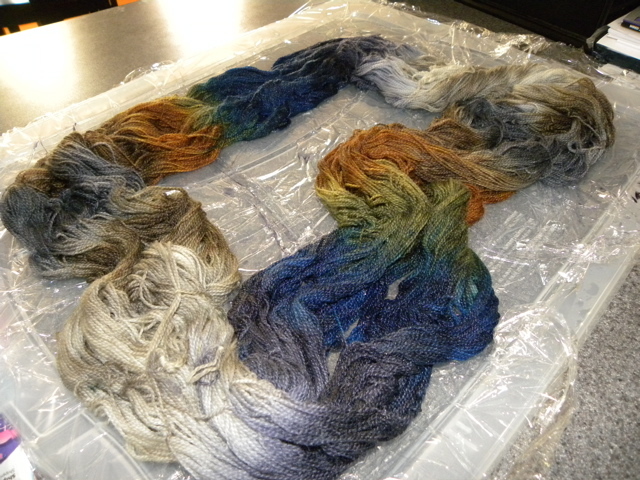 So that’s what is going on over here in the Yarn Lab. 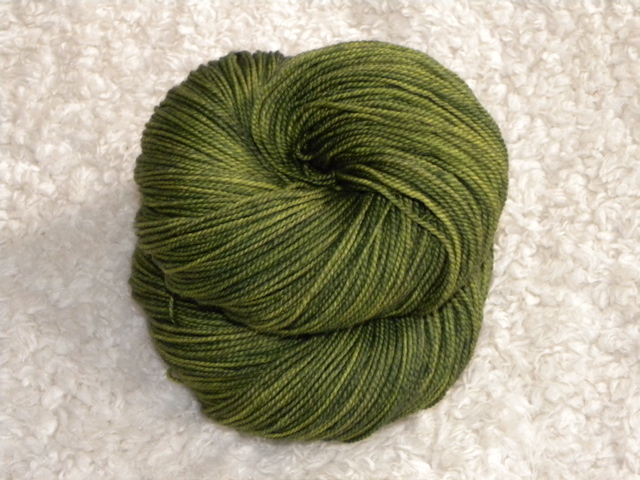 It’s going to be one incredibly busy summer, cranking out skeins of yarn like it’s my job. I’ll still be putting them in my Etsy shop, so you can buy whatever I make until September, and that’s when I’ll put my shop on vacation and sell whatever I have left. Now it’s time to get in my jammies and curl up with my book. It’s been a long day. Danielle! I’m so excited for you to be doing those shows! I wish I could be there! (wait. . .maybe i can. .. send me some info on these events. How did this happen? who asked you to vend? Hi Breida! Although I’d LOVE to see you, I don’t know that either festival is going to be worth driving all the way out here. If you’d like to know more about either one, just click on their names in my post, I linked them to their websites. The one in Lynn is linked to its FB page. That one is more for arts and crafts vendors, and sounds much bigger than the one in Haverhill. But I’m excited about them both! Hee Hee – we are going to have sooooo much fun. My indigo pot is still not quite right (still too much oxygen in the pot) but I will have it working fine by the morning. 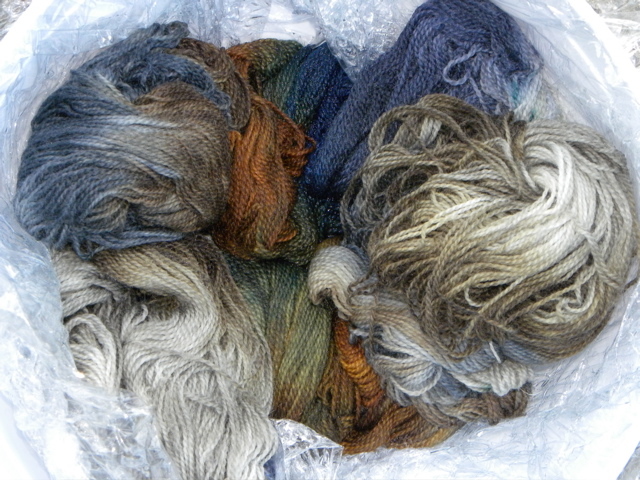 Tomorrow I will be adding LOTS of yarns to our sale stock. Well – at least dyeing them. Then they have to dry and cure for a week and then rinse and then dry and then reskein and get inventoried but at least they will be dyed tomorrow!! I can’t wait to see what happens with the indigo. I love your color combinations. They are soooo much more interesting than mine. I have an idea to get teal, but that will wait until tomorrow. I know. You hate teal. I just want to see if I can make it!! Love you. Well!!! We all know that your Mother Loves Teal!!!!!!!! Your yarn colors AND names were great! Now I know what you both did today! I REALLY like “She Hates to Wear Dresses” and “Morning Crocus”. Gorgeous color combos! SHTWD looks like it is glowing! Thank you Kimberly! SHTWD is maybe my favorite one yet! It’s always a surprise how they’ll turn out. I start with only a vague idea of what I want, and I’m always surprised by what I get!